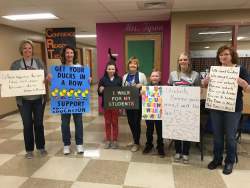 All Ponca City Public School students were welcomed back today after returning from two weeks of school closure due to the teacher walkout. Students were met as they arrived outside and inside the buildings with signs, cheering and celebrations in morning assemblies. 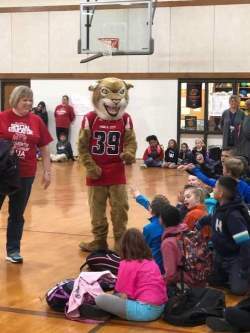 Teacher Jessica Wyckoff and Willie Wildcat welcoming students in their morning assembly. 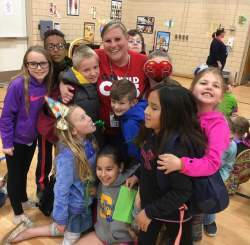 Teacher Kara Anderson and some of her students. Cara Holland, Amy Hollingsworth, Azaria Baker, Tanya Gibson, Aidyn Phillips, Cheryl Nichols, Amy Muegge welcoming students. Arrott continued, “Healing is never a one day event; it is going to take time. However, I believe the challenges and victories of this movement have been a driving force of team building for the district. I have never felt that PCPS has been more of a ‘TEAM’ than we are now.